Teide was the main reason we decided to have a short trip to Tenerife and not stay only in Gran Canaria in our holiday. In the end, the idea of climbing a mountain and not staying only on the beach seemed a great idea to have a full-option holiday. While planning the trip, I ran across Teide by mistake over the internet and reading that it’s the highest peak in Spain and the 7th most high in Europe, we said that this is something we must absolutely do. Not to mention that it’s higher than any of the peaks we have been before (highest being the Moldoveanu Peak – 2544m, from the Romanian Carpathians). Mount Teide (Spanish: Pico del Teide,) is a volcano on Tenerife in the Canary Islands. Its 3,718-metre (12,198 ft) summit is the highest point in Spain and the highest point above sea level in the islands of the Atlantic. At 7,500 m (24,600 ft) from its base on the ocean floor, it is the third highest volcano on a volcanic ocean island in the world after Mauna Kea and Mauna Loa in Hawaii. Its elevation makes Tenerife the tenth highest island in the world. It remains active: its most recent eruption occurred in 1909 from the El Chinyero vent on the northwestern Santiago rift. The United Nations Committee for Disaster Mitigation designated Teide a Decade Volcano because of its history of destructive eruptions and its proximity to several large towns, of which the closest are Garachico, Icod de los Vinos and Puerto de la Cruz. Teide, Pico Viejo and Montaña Blanca form the Central Volcanic Complex of Tenerife. The volcano and its surroundings comprise Teide National Park, which has an area of 18,900 hectares (73 sq mi) and was named a World Heritage Site by UNESCO in 2007. It is one of the most visited National Parks in the world, with a total of 2.8 million visitors, according to the Instituto Canario de Estadística (ISTAC).In 2013 it was the ninth most visited national park in the world. The Teide is therefore, the most visited natural wonder of Spain, and one of the most visited in the world. Getting to the Teide National Park is very easy if you have a car. And getting to the Teide Peak is even easier. When I first read that the peak is more than 3000m high scared me a bit, knowing how we managed to climb the highest Romanian Peaks. I was expecting a long journey, a lot of hours of hiking, maybe with a bit of bad weather and a lot of effort. But after reading some more about how to get there, it turned out that it will be quite a simple and relaxing journey. The road takes you to the Teide Peak base which is 2250 m high, so you can basically drive almost all the way up. Plus you get an amazing view on the way, we had to stop so many times to takes photos, because everything around us was just beautiful. From the base of the peak, there is a cable car that will take you up to about 3500 m high in just 8 minutes, and there you are, almost on the top. But, considering that the Teide is still an active volcano and, well, we should be careful about that and not make him angry, access to the peak is restricted to only 200 visitors a day. To be one of those 200 people you have to obtain a permit at least 24 hours prior to your visit. The permit can be used only during certain hours (the timetable that best fits you) and you are only allowed to spend maximum one hour up, from the moment you started climbing the last 200 meters until the moment you return to the cable car. But once you are on top of the Teide, well..things chance. You have a perfect view around you, the images in front of your eyes are just spectacular. Not to mention, that, as the volcano is still active, gas emissions happen from place to place and you might get hit by a sulfur smell from time to time. That can be somehow a bit scary, knowing that the volcano could erupt at any time. 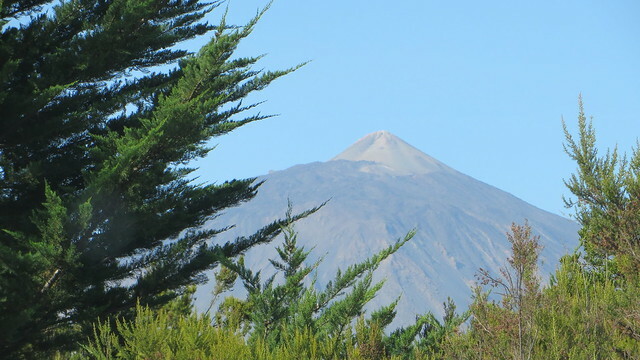 Well, not really at any time, as the place is very good monitored and if there is an increase in the volcano’s activity (which has not happened in many years), the park closes and no tourists are allowed there anymore. The Teide National Park website says that you have to come well prepared if you want to go on top of the mountain. You have to wear very warm clothes, hiking shoes and you have to have a good health conditions. Honestly, I was expecting to feel a bit dizzy being at almost 4000m high, but I didn’t feel any difference. I felt perfectly normal. Also the weather was very nice and warm (not as hot as on the beach), but having only a t-shirt and a hoodie on was more than enough. They say that sometimes the wind can be very strong, but while we were up there, it was not the case. We did spend some time exploring a bit the rest of the Teide National Park. The landscape was totally strange and alien to us. Solidified lava everywhere, strange rocks and red sand, it is almost like a lunar scenery. The feeling that you are on an alien planet is present with you at each step. It’s a totally science fiction experience. There is barely any vegetation, only some dry bushes (probably during summer they are green and flowers blossom), it seemed as if we were on another planet. As you go down and get closer to the sea level, forests appear and everything turns green. Permit to go up on the Teide Peak : should be obtained at least 24 hours before your trip; ideally you should book your time slot much more in advance, as it can get very crowded and you might not find any time slot available.